1. Stephen Baldwin - Napoleon's March; 2. Audrey Smith - The Death of Parker; 3. Bob Bray - The Flowers of Bermuda; 4. Lizzie Higgins - The Beggar Man; 5. Lizzie Higgins - Johnny Sangster; 6. Jumbo Brightwell - The Drowned Lover; 7. Fred List - The Barndance; 8. Buell Kazee - The Inconstant Lover; 9. Dixon Sisters - My Little White Hat; 10. Perry Riley - Somebody Gonna Miss Me ; 11. J P Fraley - The Yellow Rose of Texas; 12. Weenie Brazil - Son Come Tell it Unto Me; 13. Angela Brazil - The Poor Smuggler's Boy; 14. Lemmie Brazil - Two Stepdances; 15. Ken Langsbury - The Bishop of Worcester; 16. May Bradley - On Christmas Day; 17. Art Galbraith - Paddy on the Turnpike; 18. Roger Cooper - Pretty Little Indian; 19. Morgan MacQuarrey - Warlocks Set; 20. Nimrod Workman - Oh Death! ; 21. Fred 'Pip' Whiting - Will the Waggoner; 22. Bill Smith - Ram She Add-a-Dee; 23. Harry Langston - Posey Joe; 24. Sarah Makem - The County Galway Girl; 25. Sarah Makem - The Month of January; 26. Sarah Makem - Miss Jenny; 27. Dooley Chapman - Old Dan Tucker; 28. Jack Smith - Shooting Goshens Cockups; 29. George Belton - Has Anybody Seen My Tiddler? ; 30. George Townshend - The Burial of Sir John Moore. 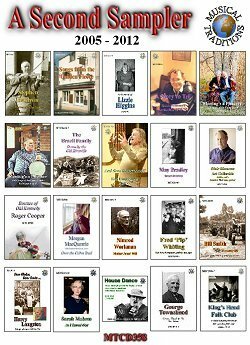 Beavering away in what he describes as his "little wind-powered forge" in Stroud, Rod Stradling's Musical Traditions label (from the web resource of the same name) have amazingly issued 90 discs in the past 14 years. In their typical DVD-cased boxes to allow larger format booklets, this is an exemplary (and genuine) cottage industry, matching and exceeding what labels like Topic used to release in their heyday for quality and content. Only Veteran out in East Anglia can match this dedication and achievement. On this second sampler of their output, familiar names of the tradition from this side of the Atlantic like Stephen Baldwin, Lizzie Higgins, Sarah Makem, Jumbo Brightwell, the Brazil Family, May Bradley, Fred Whiting and George Belton and great American traditional icons like Nimrod Workman and Buell Kazee rub shoulders with lesser-known but always excellent local performers well recorded in clubs, sessions and homes. From unaccompanied ballad singing to spirited melodeon, fiddle and banjo tunes, pretty much every track - picked for no other good reason than that they're Rod's favourites - is a delight, and accompanied by good excerpts from the sleevenotes of the source albums. 30 tracks, 79 minutes, 24 page booklet: deal! Actually, you can easily put this alongside those Voice of the People sets. Full marks to the be-slippered guru, and it really makes you wonder why the EFDSS, swimming with public funding as they now seem to be, can't do this sort of thing when a little homely house up a hill in the Cotswolds can.